I got the old horn out today and gave it a bath. Took it apart, put it in the tub, ran some tepid water and added a dab of Palmolive dishwashing soap. Let it soak for about 20 minutes, and sluiced the inner part of the slide with a cotton cloth wrapped around a metal rod (designed just for cleaning trombones). 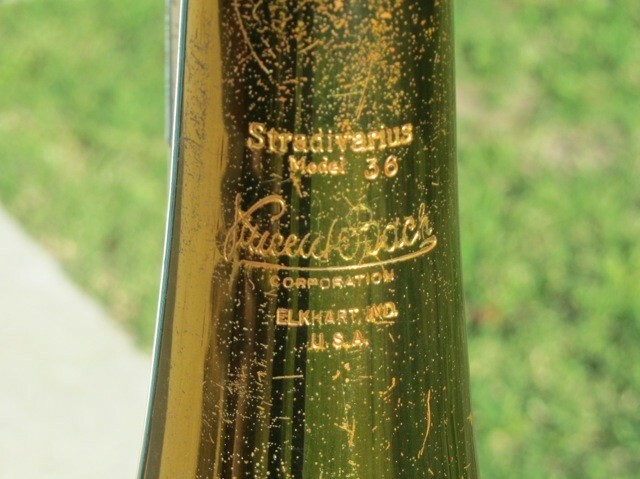 The trombone is a Bach “Stradivarius” Model 36, manufactured in Elkhart, Indiana and considered professional grade. I’ve had it since my college days, bought it used then, and it looks rather worn now. 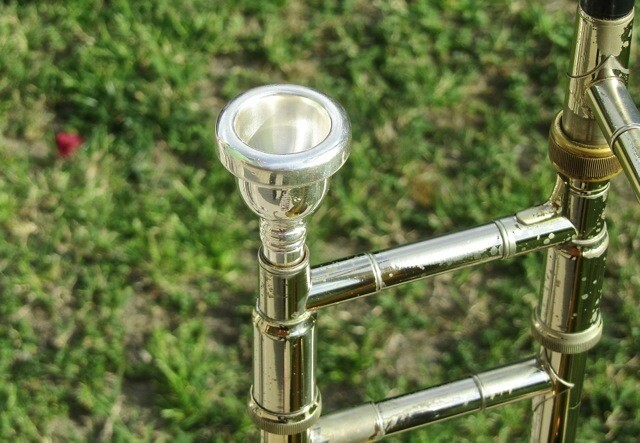 The mouthpiece is a custom job, made by Larry Minick, a famous brass instrument maker in Los Angeles. After its bath, I greased up the slide and it works nice. I played a bit, and the horn sounds great, if you factor in the currently decrepit state of the player. I say “currently decrepit” because I aim to change that. On April 8, I’ll be playing side-by-side with the Pacific Symphony, under the baton of Carl St.Clair, as part of an initiative the orchestra calls “OC Can You Play with Us?” and designed to allow amateurs the chance to perform with the group. I’ll be playing the second trombone part in the finale of Shostakovich’s Fifth Symphony, which has some great stuff for the brass, I’m sure you know … so, I started practicing today. Our first (and I think only) rehearsal is next week. The concert is free; I suppose it has to be. I’ll be writing about my experiences in the Orange County Register. Second chair? Not Principal?!! Seems criminal to me (ok, maybe not). As long as you guys play some ska as an encore, I’m good with it. CK, they gave me the option of choosing the first, second, or third trombone parts. I decided to go with trombone TWO, for various reasons, among them: the part has the same great lick at the beginning of the fourth movement as the first trombone, and I really don’t want to look like an idiot, given that I went to school with both the first and second trombonists of the Pacific Symphony, and they rock. How exciting! What’s the date? Also, your trombone looks great in the backyard! Well, I think I sent you my Three Monologues for Trombone and you can see how well you cope with them things since they shouldn’t be any harder than the Shostakovitch. .Maybe you need a challenge? That’s so exciting! 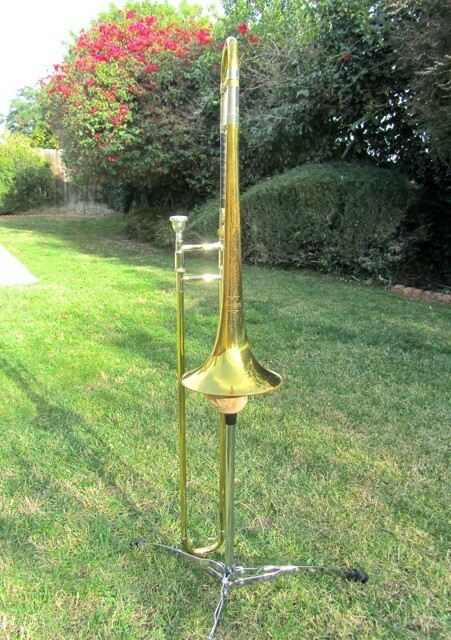 My trombone is the same model but was made more recently. I hope you enjoy the experience! Great news! I’m looking forward to it and hope you enjoy every minute! Looks like a lawn watering device from which will flow grand melodies, I’m sure.